Melvin Tinker has written an excellent short primer on the contemporary influence of cultural Marxism and how we can respond to it. Tinker draws inspiration from C.S. Lewis’s novel, That Hideous Strength, which was the third of Lewis’s three-part science fiction space trilogy published in 1945. The novel is an exploration of the possibility of an intellectual elite imposing a godless ideology that runs counter to common sense on the masses. Tinker sees Lewis as ahead of his time in foreseeing how the increasing influences of materialism, scientism, and naturalism would naturally progress. Tinker also draws inspiration from the story of the Tower of Babel which he describes as “an exercise of collective rebellion” against God (p38), in an attempt to set up a rival cosmology to that of the creator. Tinker then takes a look at neo-Marxism, also called cultural Marxism, or libertarian Marxism. This can be defined as a philosophy of human liberation from all repressive social institutions. Hidden behind this definition, which sounds uncontroversial at first sight, is the understanding that family is seen as a repressive institution, as is church, business, any authorities, and traditional perspectives. In what Tinker describes as “a semantic sleight of hand”, those who disagree are labelled ‘fascist’ even though this strays far from the original meaning of the term. Key thinkers in this rebellious school of thought include Herbert Marcuse with his idea of ‘repressive tolerance’ which is really ‘totalitarian tolerance’ which aims to silence any dissenting views. There is also Antonio Gramsci with his concept of ‘hegemony’. ‘Political correctness’ is actually a manifestation of cultural Marxism. Political correctness is totalitarian in seeking to stigmatise and shut-down dissenting opinion. Cultural Marxism is not open to reason or debate. Certain opinions are unacceptable and should not be expressed. This is linked to what C.S. Lewis labelled ‘Bulverism’ whereby an opponent’s dissenting beliefs are assumed to be the result of some bias and can be discredited merely on that basis rather that with reason and logic. Tinker elaborates on the strategy to push this rebellious agenda by normalising homosexuality and promiscuity and desensitising people to immorality. This has been done very successfully in the media where there are disproportionate portrayals of homosexuality and other sexual immorality. Tinker highlights the case of Felix Ngole who was expelled from Sheffield University for expressing that homosexual practice is sinful. Non-conformity with this radical agenda can now cost you your job or your career. Society is being pressured to conform to this cultural Marxism, even when it flatly contradicts science and common sense – as in the case of transgenderism. So how do we challenge this ‘hideous strength’ in the form of cultural Marxism? Tinker urges Christians to contend for the truth. He reminds us that the early heresies involved blurring the boundaries of truth, and this is what we face again today. Arianism blurred the deity of Christ. Gnosticism blurred the humanity of Christ. Transgenderism blurs gender differences. Cultural Marxism more generally seeks to blur the nature of authority. Tinker also calls for cultural engagement which will result in being willing to embrace courageous refusal. There is a need for a new resistance movement, of people who are not willing to be conformed to the ideology of cultural Marxism. 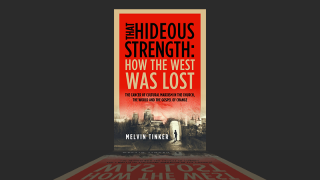 Tinker draws parallels with the situation in Nazi Germany in the 1930s where the church largely capitulated or remained silent. Will we be amongst the resistance, or will we allow ourselves to be compromised? Tinker has written a helpful introduction to challenge posed by cultural Marxism to the church and society. Although there is an extensive list of works cited, I nevertheless found it frustrating that the wealth of valuable quotes he cites in the text are not properly referenced. This is a minor criticism though. Overall Tinker’s book provides a timely and insightful critique of our rapidly changing culture, which deserves to be widely read. It is time for the people of God to expose and defeat this ‘Hideous Strength’. The Case of the Politically Incorrect Student. Felix Ngole.